Everyone wants to have healthcare that covers what they need at an affordable price. If you don’t want to break the bank getting coverage then use the free 2017 State Health Insurance Plans Michigan – North Carolina templates. These free documents give you lists of healthcare providers and their plans. You can see premiums based on age and contact information to get started when you finally decide. The templates also offer filters tools so you can find only the plans that work for your financial situation. If you’re ready to look around for plans this year then follow the instructions below. To download the template file to your computer, scroll to the bottom of this page and follow the link next to your state. This will automatically download the template file to your computer. From there, you can open the file on your computer. This set of templates contains insurance plan information for the following states: Michigan, Missouri, Mississippi, Montana, and North Carolina. You will be able to search for Federally-facilitated Marketplaces and State Partnership Marketplaces. 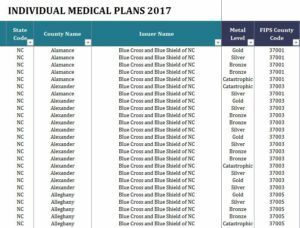 The 2017 State Health Insurance Plans Michigan – North Carolina templates can be broken down into two simple sections. The first helps you select your state, county, and healthcare provider. The next section is a list of columns that displays the information about the plans offered by those providers. For example, you can see the estimated cost of insurance based on age. This can be beneficial for people just starting out with a healthcare insurance plan. If you live in one of the states and are looking for the best healthcare plan to suit your lifestyle, then follow one of the links below and get started today.